Cliftonville produced a commanding display to breeze past Coleraine at Solitude on Wednesday night. Davy McDaid’s penalty sent the Reds on their way, with Jay Donnelly netting twice ahead of Stephen Garrett’s late effort putting the seal on a 4-0 triumph. Having each enjoyed opening day triumphs, neither boss saw fit to tamper with their line-ups with Coleraine’s weekend hero James McLaughlin once again having to make do with a place on the visitors’ bench. Former Linfield duo Rodney Brown and Sammy Morrow were once again partnered in attack, with former Dergview full-back Garth Falconer afforded a further opportunity to demonstrate his ability at Premiership level at the other end of the park. Minus the services of suspended duo Jaimie McGovern and Ryan Catney, Reds boss Tommy Breslin was able to welcome Marc Smyth back from injury with the former Morton centre-half a surprise inclusion on a bench that also included Stephen Garrett; himself continuing his battle back to full fitness. Coleraine should have opened the scoring after just 10 minutes when, with the home defence caught napping, Morrow found himself clean through on goal but chose to get his shot away early and was unable to direct his attempt on target, much to the frustration of the fans sat just yards behind it. They were on their feet shortly afterwards, though, only to have their celebrations snuffed out when Peter Burke produced a wonderful one-handed save to prevent Brown’s fizzing strike from arrowing into the bottom corner. Having bossed the early exchanges, the Bannsiders then found themselves under the cosh for a long spell and fell behind when David Ogilby’s trip on Chris Curran earned a home penalty. Despite vigorous protests from Kearney’s players, referee Keith Kennedy was correct to rule that the offence had taken place inside the area and, following a lengthy stoppage, McDaid made no mistake from the spot. 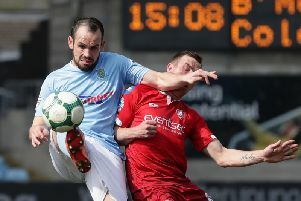 After Chris Curran had drawn a save from Michael Doherty and Ruaidhri Higgins had clattered the crossbar with a free-kick, the Reds doubled their advantage when McDaid and Martin Donnelly linked up to provide Jay Donnelly with a simple finish. The Bannsiders looked to have pulled one back on 52 minutes when Brown’s header beat Burke but, with Morrow poised to tap in, Caoimhin Bonner executed an inch-perfect challenge to start the move which ended with Donnelly converting his second of the night. The outcome no longer in doubt, Garrett would have the final say when, having earlier seen an attempted chip well stopped by Doherty, he gave the Bannsiders’ keeper no chance with a delightful long-range attempt that swerved and whistled its way into the top corner. CLIFTONVILLE: Burke, Bonner, Flynn, Knowles, Curran, McMullan, McDaid, M Donnelly, Seydak, J Donnelly, Cosgrove. Subs: Garrett (Knowles, 64 mins), Brennan (McMullan, 81 mins), Smyth, Murray (McDaid, 71 mins), Morgan. COLERAINE: Doherty, Beverland, Mullan, Higgins, Douglas, Ogilby, Morrow, Harkin, Brown, Parkhill, Falconer. Subs: McCauley, Canning (Beverland, 46 mins), McLaughlin (Ogilby, 46 mins), Lyons, McGonigle (Morrow, 68 mins).